“I can’t think anyone can call today’s PMQs anything other than a total walkover for [Ed Miliband]. Not often one can say that” observed Iain Dale yesterday. Mil The Younger had finished his questions by goading Young Dave over TV debates, which, as has come clear overnight, he would rather avoid if it’s all the same to the other party leaders. On this subject, the leader of the opposition had Cameron bang to rights. However, and here we encounter a significantly sized however, Dale had reckoned without the tendency to spin, combined with the resentment felt towards Miliband by disaffected Blairites, and the need for some parts of the press to slag off the Labour leader, whatever the outcome of PMQs. From the word go, there were plenty of pundits ready to tell him that he hadn’t seen Dave coming off worse. Indeed, almost straight away came the all-too-predictable knee-jerk reaction of the Telegraph’s legendary blues artiste, Whingeing Dan Hodges, who moaned “Ed having as bad a session as I’ve seen”. Dale was incredulous: “Are you serious? He trounced Cameron today!” But Hodges will thcweam and thcweam until he gets the other Miliband. And then came the retelling of the on-line punditry. This meant the likes of Simon Carr, who writes his routinely abusive “sketch” for the perpetually thirsty Paul Staines at the Guido Fawkes blog. Carr at least put away his borderline anti-Semitism - recently he was calling Miliband “other-worldly” and “Crucifixion material” - as he urged readers to “look over there”: “It’s always exciting to discover a new low in PMQs”. And whose fault was that? As if you need to ask. 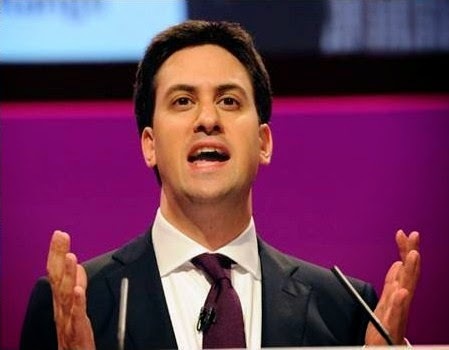 “Miliband spent half his quota of questions on challenging Cameron to a television debate. There is a rumour that Cameron was going to challenge Miliband to a television debate and has thus been outflanked. If this is the size of it, the opposition leader showed himself to be one pitiful pygmy”. This had the disadvantage of making no sense at all: Dave was never going to provoke a one-on-one with Miliband. And there was yet more spin in today’s papers. I warned Dale yesterday “Just wait till you see Quentin Letts’ retelling in tomorrow’s Mail”, and Quent did not disappoint. “Mr Miliband was again made to look a fool. The thrashing he received yesterday, so close to an election, was worse than I recall Iain Duncan Smith ever receiving from Tony Blair. Time and again Mr Cameron seized on things Mr Miliband had said and turned them to his advantage. Time and again the Government backbenchers cheered and the Labour lot sat in glumness”. Never mind reality, Dave won! Trebles all round!! 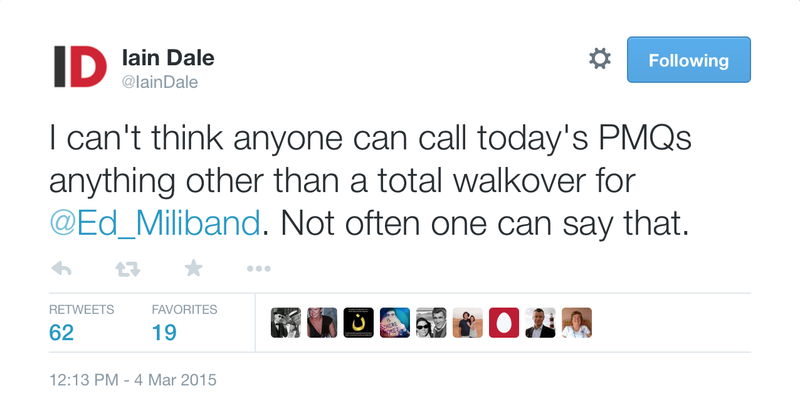 Iain Dale was right in that Miliband bested Cameron yesterday. But wrong to think the Usual Suspects were going to admit it. And that leads back to the same question that has been asked for some months now. If Miliband is so useless, why all the attention, all the abuse, and all the spin?